We are always waiting. Waiting for others. Waiting for a good opportunity. Waiting for the doctor. Last week, I waited in line for a new passport. I work in the same building as the passport office and had been watching the line grow and snake around the fountain and back again. Some days are worse than others. 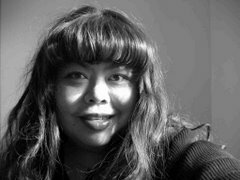 The beginning of the week is bad- so is the beginning and the end of the month, after holidays and after its been on the news.So there I was, patiently waiting in line along with everyone else, resigned to waiting. We wait for better times, we wait for spring (have we ever been waiting- there still is snow on the ground and I spent 10 minutes this morning, scraping off the ice on my stairs so the postman doesn't slip and fall when he brings me my bills and the swaps I've been waiting for). Is it just a human thing- this waiting? 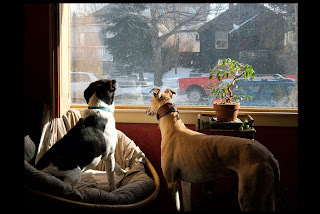 On the weekend, I was in Calgary and spent some alone time with my canine nephews and got this lovely picture of them waiting for their "parents" who h ad gone out for Easter dinner. They looked particularly cute, those boys. Van Gogh "Go Go" Feener is the spotchy one and Salvador "Bo Bo" Feener is the fawn coloured greyhound. They both ended up taking my brother-in-law's name so when they get into trouble, they are called by their full name, just like all us humans are when we are in the doghouse. Gogo and Sal, as I like to call them, are very different. Sal is content to wait patiently, while Gogo is very impatient and isn't shy to let you know- although that dog exhibits incredible tenacity when he wants something and will wait if he thinks there is a reward for him at the end of it (usually it's food and just for his sheer willpower, we often cave and give in to him). My father and him share a very funny relationship and Gogo has no qualms about complaining loudly through crying when dad teases him by denying him his reward. Right now, I am waiting for a friend to give birth. I made some card samples for her in case she wants to use the idea for her baby announcements.Actually, I just love making samples even if I don't have babies to announce. This is a 4.25inch x 4.25inch card. 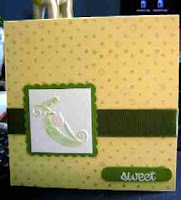 Stamps: "sweet" from So Very ( Stampin'Up! Saleabration 2007 set), Polka dots from Stampin'Up! Petals and Paisley Set. Accessories:Mega scallop punch, Cuttlebug "It's a Girl" embossing set, chalks, wide olive grosgrain ribbon. Posted by Diane aka cameldiva at 9:22 a.m.
(naggy friends, aren't they the best). April 24, 2007 at 11:07 p.m.
Nice pic of my nephews too!! May 16, 2007 at 11:51 a.m.